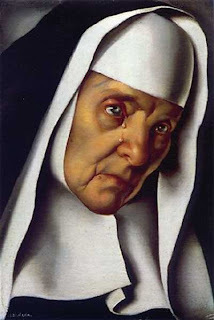 Pessimist Incarnate: Mother Superior what a cow! When the spirits take you! In a convent in Ireland, the 98-year old Mother Superior lay dying. The nuns gathered around her bed trying to make her last journey comfortable. They tried giving her warm milk to drink but she refused it. One of the nuns took the glass back to the kitchen. Then, remembering a bottle of Irish Whiskey that had been received as a gift the previous Christmas, she opened it and poured a generous amount into the warm milk. Back at Mother Superior's bed, they held the glass to her lips. The frail nun drank a little, then a little more and before they knew it, she had finished the whole glass down to the last drop. As her eyes brightened, the nuns thought it would be a good opportunity to have one last talk with their spiritual leader. "Mother" the nuns asked earnestly, "Please give us some of your wisdom before you leave us." "DON'T EVER SELL THAT COW!"